Restoration of Melbourne’s oldest Greek Church Evangelismos will continue into 2018 as work to clean up debris and restore the extensively damaged ceiling continues, according to members of the committee managing the project. Speaking to Neos Kosmos, Greek Orthodox Community of Melbourne and Victoria (GOCMV) president Bill Papastergiadis confirmed the contracts to start the restoration were recently signed, and the first stage of the project will be completed soon. He said workers are currently on site with a superintendent, and that works are being run “professionally and appropriately”. GOCM treasurer Marinis Pirpiris said there are some obstacles the team is facing, and stage two of the process is dependent on funding and heritage approvals but he remains optimistic. 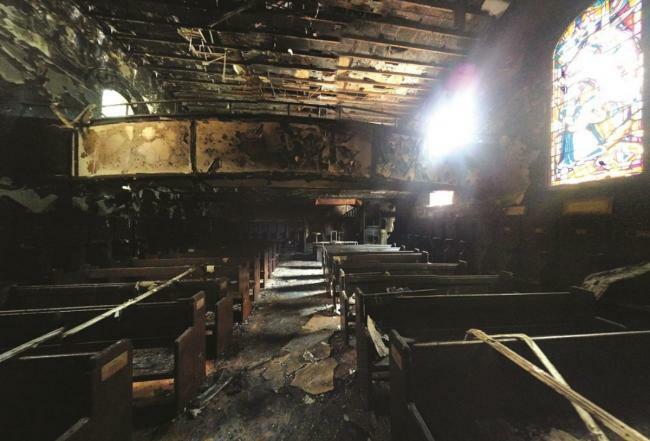 “Churches take time to get built … there is lots of energy and passion to complete the restoration earlier,” he said. A devastating fire in May 2016 rendered some original features unable to be fully restored. The Church of the Holy Annunciation was built by N Longstaff in 1901 to a design by noted architects Inskip and Butler. The design is drawn from French and German Medieval sources and presents a simple brick and terracotta design. It is heritage listed by the state of Victoria. Mr Papastergiadis said while some features could be restored, others were “damaged beyond capacity to repair” adding that there is a special subcommittee appointed to locate and procure appropriate and equivalent types of antiquities. “Or [we can] get the iconographers back to recreate [element] as best they can,” Mr Papastergiadis said. Morea architects’ project leader Constantine Moschoyiannis has designed Greek Orthodox churches for over 30 years and said the church is significant for historical, cultural and heritage perspectives. Mr Moschoyiannis said the building had not had an upgrade and was a testament to the original builders. However, with the go ahead for stage one, stage two of the restoration could include a two-storey atrium with new facilities including toilets, a priest’s office and the altar, among other improvements. Other changes proposed by Mr Moschoyiannis are pending approval. Preventative measures to avoid future damage will be taken, in line with hertiage Victoria guidelines. “No stone is being left unturned in terms of ensuring that it meets the high standards in terms of fire prevention,” Mr Papastergiadis said. Mr Moschoyiannis said parishioners can expect to use the church by early next year. This article appeared online and in print.